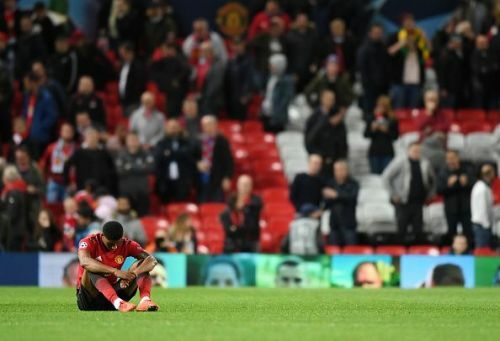 Manchester United's fortunes are yet to improve as the side was held to a goalless draw in their Champions League Group H clash against Valencia at Old Trafford. The pressure continues to mount on manager Jose Mourinho as the game has been deemed boring by fans and pundits alike. The stalemate was far from the result that the Portuguese would have wanted especially as United legends - Ryan Giggs, Gary Neville, David Beckham - were all in the directors’ box at the stadium. United stands second in Group H with four points from two games, while toppers Juventus have earned six points from their perfect League start. Valencia stands at third with one point while Young Boys are at the bottom with zero. The game saw United lacking the edge to earn the much-needed three points. Despite pressure in the last few minutes of the game, United could not convert the home advantage and ultimately saw their win-less run tally to four games. Speaking at a post-game conference, the Portuguese manager said, "I think there are things that is difficult for me to say and if I say something funny, I'm leaving myself... it would be another reason to criticise me and I think you have enough." "So, I prefer just to say that when last season we finished second and we finished runners-up in the FA Cup, we won our group in the Champions League. I thought it was a fantastic season. I knew why." Speaking to BT Sport, he said, "In such a difficult group, if you cannot win, you don't lose. We were the team that tried more, that had probably a couple of big chances to win, but I accept the result as a fair result." "The players, they tried, they raised the level of their effort, they raised the level of their intensity. We tried to play but in some crucial phases we didn't have the technical quality to build from the back." "We knew we would not create 20 chances. Our attacking players are not in their best moment of confidence and individual performance level, so we thought with three or four chances we would score and win the game, which we didn't." "It's not a bad result but it's not a good result. We have Newcastle before the league stops [for the international break] and after that we have Chelsea and Juventus in three days. It would be really good for the team if we can beat Newcastle." Put Mourinho and United players out of their misery. What is the point in continuing like this? What is the point in trudging on in this warped belief something will click and it’ll sort itself out? It’s nonsensical. Only Jose Mourinho could have a team consisting of Paul Pogba, Martial, Mata, Sanchez, Rashford and Lukaku and then decide to play like a 2009 version of Stoke City. Mourinho has United playing like a league 2 side away to a Premier League team, at home. Terrible to watch. Sitting back with no imagination, theatre of dreams? Jose Mourinho truly is an artist. Man just loves to draw. I’m baffled why Mourinho doesn’t start Fred. Let’s be real: Mourinho has not a scooby how to sort this and there’s not the slightest chance United will be good enough or interesting enough under him. The longer he stays, the more players mentally check out, the more poisonous it all becomes.